This potentially outstanding, dark ruby/plum-tinged 2008 reveals notes of caramel, cedarwood, herbs, earth, foresty and red as well as black fruits, excellent to outstanding density and medium body. The tannins remain elevated so this offering will benefit from 2-4 years of bottle age. It should last for 15+ years. Tasted ex-chateau and single blind in Southwold. Now, this is a great Certan-de-May. The nose demands a great deal of coaxing from the glass: mulberry, wild strawberry, bright red cherry and crushed stone, opening up nicely but very gradually with aeration as if teasing you. 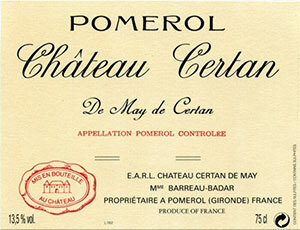 The palate is medium-bodied with firm, grippy tannins. Very focused, classy, tight but destined to give pleasure after ten years in bottle. Tasted January 2012.